When GE Lighting recently became Current, powered by GE, a first of its kind energy company for GE, this was not just a new logo design; this was the creation of a new company aimed at leading a significant change in energy delivery. 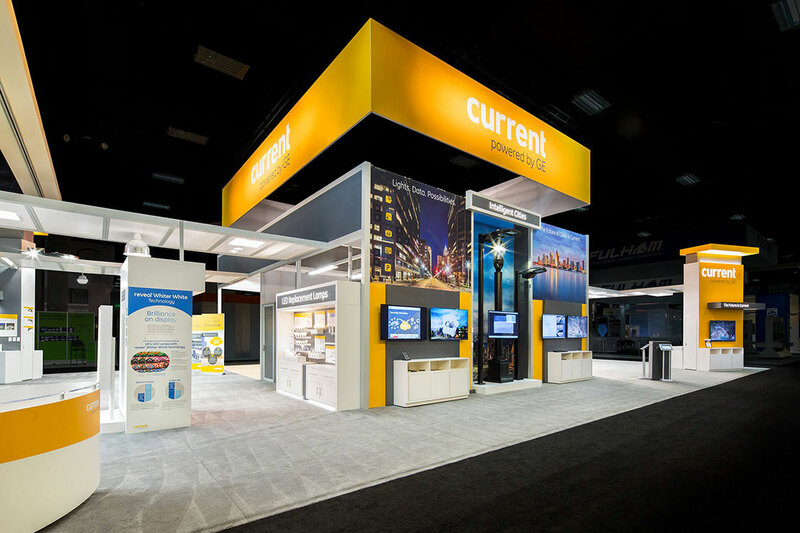 Current blends advanced LED lighting with networked sensors and software to make commercial buildings and industrial facilities more energy efficient and productive. Current is helping businesses and cities unlock hidden value and realize the potential of their environments. 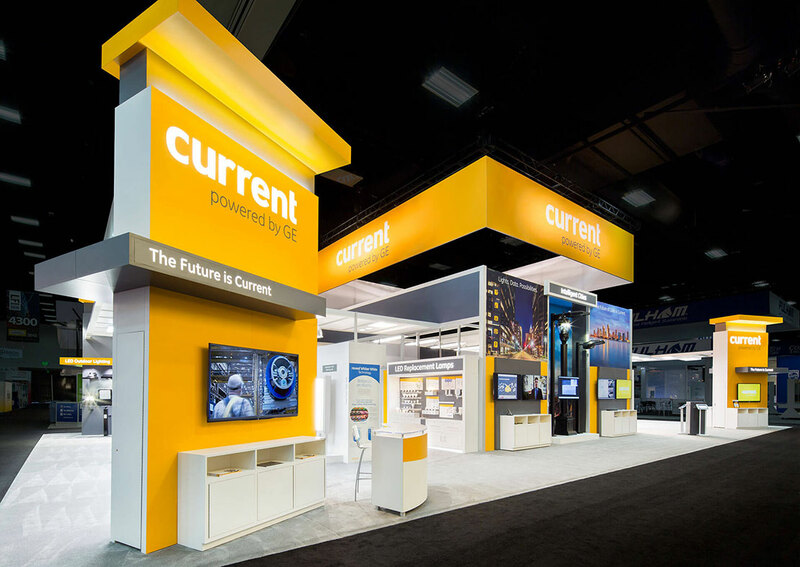 GE approached CEI to create a 60’ x 90’ exhibit with entirely new branding and needed the booth built with modular elements that could be broken down for smaller shows. Our challenge was to create a distinct exhibit that created awareness and showcased the brand while demonstrating how Current is taking its transformation out of the lab and into the real world. They needed the ability to display a broad variety of light fixtures that were specific to each show’s market and target audience. Our Design, Engineering, Account Management, and Sales Team met with Current to understand their challenges, target audiences, and exhibit goals. 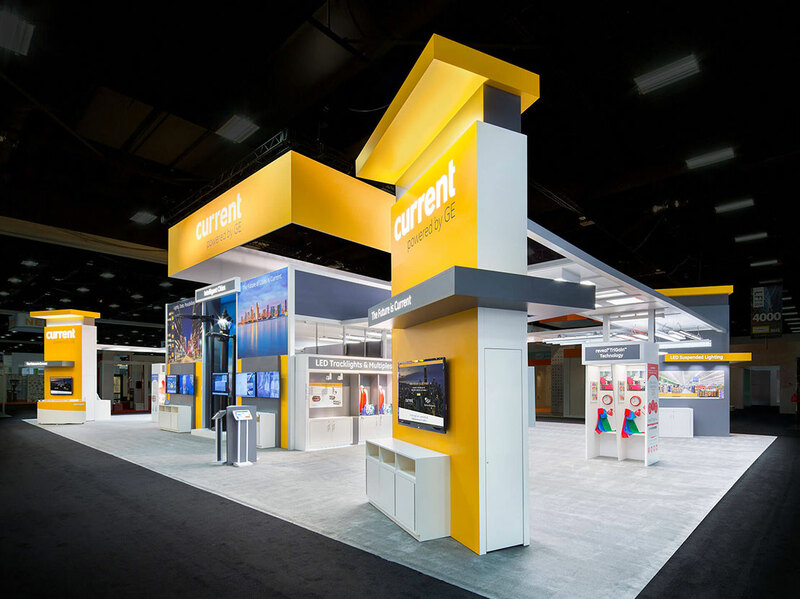 As a team, we identified the importance of building a modular exhibit for different shows and realized how vital the modular lighting display system would be to the success of this project. Our solution was to create a modular central tower structure that prominently displayed the new branding using lightweight aluminum framing and tension fabric. Below this hanging structure was a 16’ tall aluminum framework that contained two large air-conditioned conference rooms, a 20’ x 30’ retail lighting demonstration area, an outdoor lighting demonstration space, flanked by two specialty lighting displays. We created four towers displaying the new corporate colors with backlit logos, video messaging, and an interactive touchscreen presentation to inform the attendees of GE’s new marketing direction. Connecting throughout the structure was a new modular display system designed to display more than 75 different GE fixtures that can be moved and changed easily depending on the show they were attending. 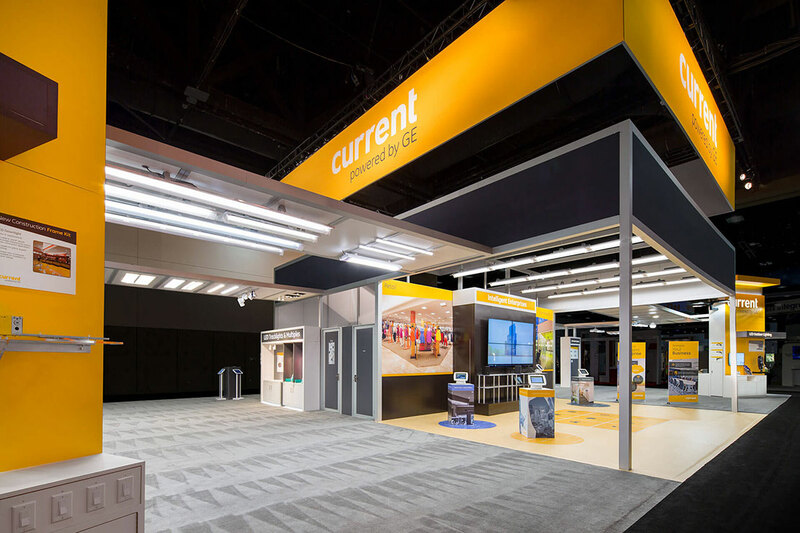 This approach allowed us to repurpose the exhibit properties for smaller 20′ x 20′ exhibits providing Current with new exhibit properties to support their trade show program. CEI was able to increase awareness for the rebranding from GE to Current in a cost-effective manner across many different markets and shows.